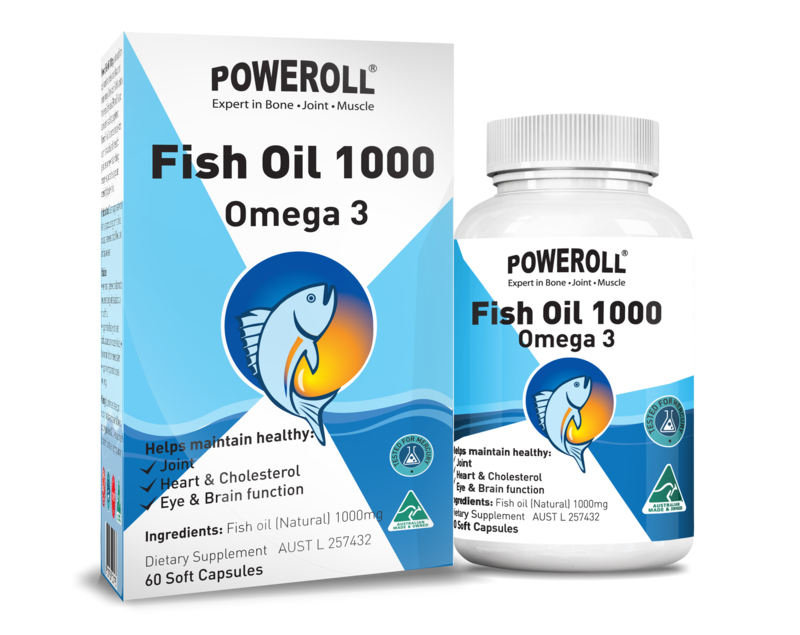 Poweroll Fish Oil 1000mg is extracted from cold water fish and is a natural source of marine omega-3 fatty acids. Fish Oil contains the omega-3 fatty acids EPA and DHA, and can be taken as a dietary supplement. Poweroll Fish Oil is sourced naturally from ocean fresh wild fish, and is tested for pesticides and heavy metals including mercury - so you can be sure you are receiving high quality fish oil! May temporarily relieve joint inflammation, swollen and aching joints associated with mild arthritis. Helps maintain healthy: joint, heart, cardiovascular system, cholesterol level, eye function, brain function, nervous system. Helps in the improvement of general well-being. Each capsule contains: Calcium carbonate 900mg (Equiv. Calcium 360mg), Vitamin D (Cholecalciferol) 200IU. For adult general wellbeing: take 2 capsules daily with food. For Arthritis/joint inflammation: Adults - Take up to 4 capsules 3 times daily with food. For heart, cardiovascular system, cholesterol level, eye function, brain function, nervous system: take 2 capsules two times daily with food. Children (under 2 years): Only as professionally prescribed. If symptoms persist see your doctor or healthcare professional. Store in a cool dry place below 30 °C. Keep out of reach of children. Do not use if cap ring is broken.